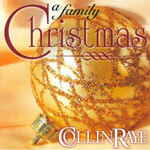 CD review: "A Family Christmas"
Taped during a live concert, country singer Collin Raye's new Christmas collection is a solid mix of holiday favorites, performed with enthusiasm and warmth. Raye isn't hard-core country, nor even particularly old-fashioned. Many of the tracks don't even seem all that country, but do have an accessible pop sensibility to them  and it works just fine. With a song list containing "Winter Wonderland," "Away in a Manger," "Santa Claus Is Coming to Town," "Silent Night" and "The Christmas Song," you know what you're getting. Raye's fans should find the album enjoyable, as should all fans of mainstream country and pop.